Well hello there! I see you stumbled upon my about me. Sadly enough I am not very good at writing about myself, but for your sake I will do my best! I am a 25 year old lesbian who highly enjoys anime, and manga. I probably enjoy it a little to much. Actually it is probably unhealthy how much I enjoy anime, and manga. To be honest I am not much a writer, but I oddly enjoy it ... which is weird, because I am very lazy, and writing is a process. Well I think that is all I will say about myself for now. My Hero Academia Vigilantes?! Senpai Breakdown and Thoughts! In this lovely breakdown I will be talking about My Hero Academia Vigilantes a spin-off series that happen years before the current My Hero Academia. If you are a fan of the current series I highly suggest picking up a copy of Vigilantes, or go to Viz Media to read Vigilantes for free! Here are the following topics I will talk about in this breakdown, the plot, key characters in volume 1, the art, and give my overall thoughts on manga itself. I was thinking this might be a fun little segment to incorporate into my blog! I thought maybe doing this every week on a certain day, but realistically I have never been good at doing things on a schedule. So what I am going to do is post an issue when I feel like it is worthy to be posted. I simply think I will be able to provide better material to talk about if I don’t feel rushed. Basically, I will bring anime, and manga news to you. I will talk about upcoming anime’s, and manga’s, articles I found interesting, maybe even incorporate some interviews with other bloggers, and much more. I would certainly love to also hear the viewers feed back and ideals as well! On that note let’s get started with issue one! Day 10: 30 Day Anime & Manga Challenge … Favorite Anime Studio? It didn’t take much thought when it came down to my favorite anime studio. The answer was very simple for me, for I knew what studio capture my heart with their movies, and style of animation. Studio Ghibli is by far one of my favorite studios in the anime industry. I haven’t watch a single movie made by them that I did not like. Their work is simply beautifully done, and so well thought out. I truly feel like they put a lot of love into what they do. Each film is unique in its own way, and they have a way with making it easy to relate to one of their films. Ghibli films are just simple magical, and touching. There are so many words that could describe Ghibli films, but that is what makes them so amazing. What’s up guys! Thanks coming back to check out another blog post done by the one only Luna Senpai. 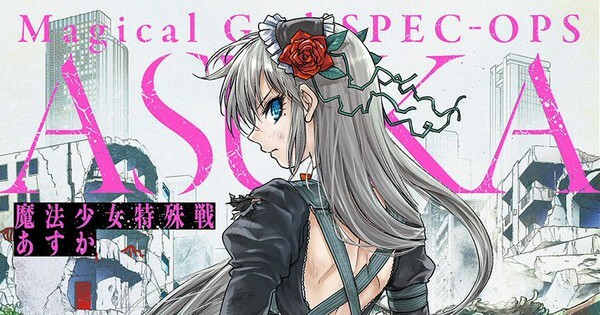 In this blog post I am going to do manga break down on Magical Girl spec Ops Asuka volume 1. I will be talking about the following topic, the plot, the characters, the artwork, and of course give my overall thoughts on volume 1. Please note there are currently four volumes translated in English available for purchases. You can also read some of the chapter for free HERE . Just to give you guys a heads up this breakdown will contain some spoilers. Meaning if you are not a fan of spoilers you may not want to read this until you have read volume 1 of Magical Girl Spec Ops Asuka. I will also be sure to source out any information I did not write for plagiarism is not cool! Are you new to the world of anime, and manga? Not sure what some of these wacky terms like, otaku, moe, waifu, and baka mean! Fear not my new friend for your senpai is here to help guide you with anime, and manga terminology 101. I am going to compile a list of common terms that I think every anime, and manga fan should. These common terms I list will be based off my opinion of what is common. Meaning you may not think that a certain word is a common term, but my friend it is okay. Why? Because we all have different opinions, and views. Day 9: 30 Day Anime & Manga Challenge – A Manga With A Lot Of Gore! Anime can be pretty gory at times however, they tend to tone it down due to Japanese broadcasting. This is what makes manga so great! For the most part you can find manga that is filled with over the top gore. For example, Berserk is far more gory in the manga series than the anime itself. Other great examples to compare are Hellsing, and Blood C (awesome anime, and manga). You get a lot of gore in the anime series, but you get even more gory scenes in the manga. If you have the stomach I would suggest to check out the manga’s of these series I listed above. You won’t regret it! October Monthly Reads – What Will Senpai Be Reading This Upcoming Month? With only a few days of September left my favorite month of the year is finally about to arrive. Meaning new manga will be hitting the shelves! In fact new manga’s has already started to hit the shelves. I went on a little adventure to the books store today. When I arrived I immediately went to the manga section. Upon my arrival I discover a few new manga’s that I had been waiting for are finally out. Low and behold I spent a good $40.00 dollars today. Did I need to spend that much no, but for the sake of my sanity it was worth every penny.